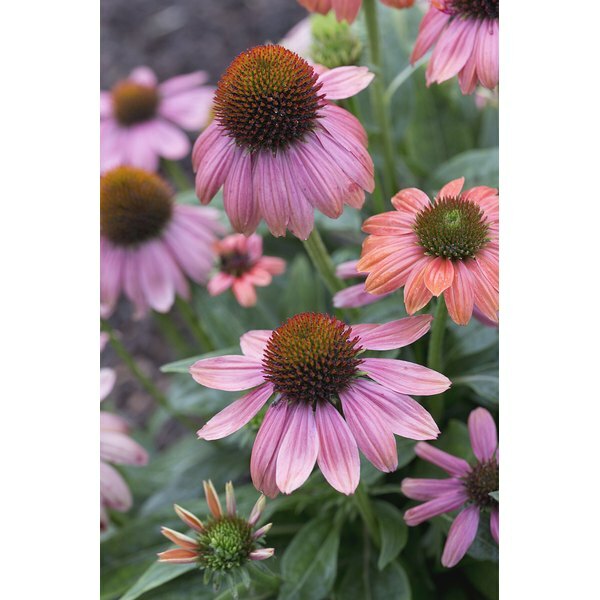 Echinacea is a Native American medicinal herb found in the United States and the southern regions of Canada. Though there are nine known species of this plant, Echinacea purpurea is the most potent and commonly used form, according to the National Center for Complementary and Alternative Medicine. Talk with your medical provider about the benefits and potential side effects of echinacea before you begin treatment with this supplement. Echinacea is primarily used to alleviate symptoms associated with the common cold, such as nasal congestion and sore throat. Taking this herb at the onset of cold symptoms is also purported to shorten the duration of cold symptoms; however, clinical studies evaluating the effect of echinacea on cold symptoms are mixed, the University of Maryland Medical Center reports. Topical treatments containing echinacea may also aid in wound-healing. Additional health benefits associated with echinacea use include diminished pain, reduced inflammation and enhanced immune function. Echinacea may also impart antiviral or antioxidant effects on the body. Typically, side effects are not associated with echinacea supplementation. Mild side effects may include nausea or stomach discomfort, sore throat, headache, dizziness, body aches or fatigue. Orally-administered echnicea may cause temporary tingling or numbness along your tongue. Children in particular may be more likely to develop a skin rash as a side effect of echinacea treatment. People who are allergic to certain plants, such as marigolds, daisies, ragweed or chrysanthemums, may be at an increased risk of developing a severe allergic reaction upon exposure to echinacea, MayoClinic.com warns. Seek immediate care from your medical provider if you exhibit allergic reaction symptoms including wheezing, intense itching or facial swelling after taking a dose of this herbal supplement. In the absence of appropriate medical care, an allergic reaction to echinacea may be life-threatening. Always talk with your physician about all medications you are currently taking before beginning treatment with a dietary supplement -- including echinacea. If you are receiving immunosuppressant therapy due to cancer, organ transplantation or other medical issue, do not take echinacea, the UMMC warns. Concomitant use of echinacea and immunosuppressants may reduce the efficacy of this immune therapy. If you have any pre-existing health concerns, be sure to talk with your physician before taking echinacea. Though treatment with echinacea during pregnancy is not known to cause fetal development problems, do not take this herbal supplement if you are pregnant unless you are under the care of a doctor. If you have an autoimmune disease or connective tissue disorder or multiple sclerosis, HIV/AIDS, leukemia, diabetes, liver disease or tuberculosis, avoid taking echinacea unless otherwise instructed by a medical professional. Are There Foods You Can Eat to Boost the Immunity for HPV? What Are the Benefits of Ashwagandha Extract?